Hot Cross Buns, church, family, spring rains, flowers, blooming red-bud trees . . . they all say EASTER to me! With the new life all around, Good Friday having passed the only thing missing is making hot cross buns for Easter Sunday! I’ll be getting together with several ladies of our community this morning in the basement of our church to make hot cross buns for our Easter service. Doesn’t that just sound too Mayberry-ish?! Well our town is just that . . . in fact I heard a rumor that Aunt Bee might even show up! Let’s make our hot cross buns! In a large bowl or the mixing bowl of an electric mixer, vigorously whisk together 3 cups of the flour (reserving additional flour for later step), the salt, spices, and 1/4 cup of sugar. Create a well in the flour and add the foamy yeast, softened butter, and eggs, and the remaining milk. Using a wooden spoon or the paddle attachment of your mixer, mix the ingredients until well incorporated. The mixture should be shaggy and quite sticky. Add in the currants, candied peel, and orange zest. If you are using a stand-up mixer, switch to the dough hook attachment and start to knead on low speed. (If not using a mixer, use your hands to knead.) Slowly sprinkle in additional flour, a tablespoon at a time, kneading to incorporate after each addition, until the flour is still slightly tacky, but is no longer completely sticking to your fingers when you work with it. Form a ball of dough in the bowl and cover with plastic wrap. Let sit, covered, at room temperature (or in a warm spot) for 2 hours, until the dough has doubled in size. Press down on the dough to gently compress it. Roll the ball of dough into a log shape and cut it into two halves. Place one half back in the bowl while you work with the other half. Take the dough half you are working with and cut it into 8 equal pieces. The easiest way to do this is to roll it into a log, cut it in half, then roll those pieces into logs, cut them in half, and then do it again, roll those pieces into logs, and cut them in half. Take the individual pieces and form them into mounds, placing them 1 1/2 inches apart from each other on a baking sheet. Cover with plastic wrap and then work the remaining dough into 8 equal pieces and place them in mounds on a baking sheet, again cover with plastic wrap. Let the dough mounds sit at room temperature (or warm place) to rise again, until the mounds have doubled in volume, about 30-40 minutes. Preheat oven to 400°F. Prepare egg wash by whisking together one egg and a tablespoon of milk. 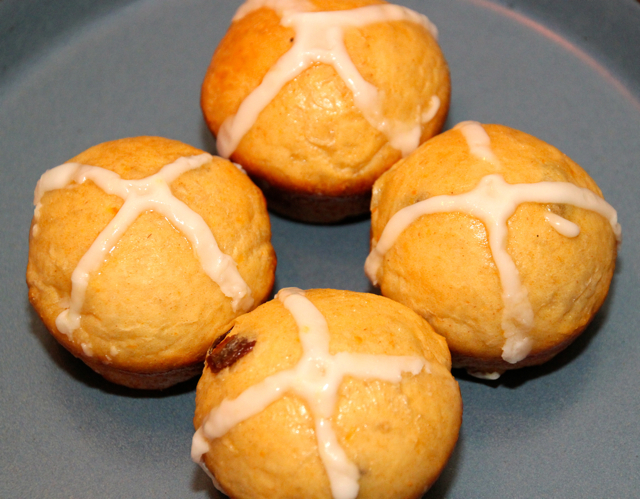 If you want, you can score the top of the buns with a knife in a cross pattern. You will want to make fairly deep cuts, for the pattern to be noticeable after they’re done. Using a pasty brush, brush on the egg wash over the dough mounds. The egg wash will give them a shiny appearance when cooked. Place in the middle rack of the oven and cook for 10-12 minutes, until the buns are lightly browned. Remove from oven and let cool on the pan for a few minutes, then transfer the buns to a wire rack to cool. To paint a cross on the top of the buns, wait until the buns have cooled (or the frosting will run). Whisk together the milk and the powdered sugar. Keep adding powdered sugar until you get a thick consistency. Place in a plastic sandwich bag. Snip off a small piece from the corner of the bag and use the bag to pipe two lines of frosting across each bun to make a cross. The next task is the easiest of all . . . eat and enjoy! As always, thank you for reading . . . and have a blessed Easter!! The theme for my April cooking class at the Lark Inn is “Lady’s Tea” and will be on April 20th and 21st. Check it out on my website and contact me to sign up if you are interested. This entry was posted on April 7, 2012, 9:48 am and is filed under Cooking and Baking. You can follow any responses to this entry through RSS 2.0. You can leave a response, or trackback from your own site.